On October 28, 2010, Mary Jo Pehl and Trace Beaulieu participated in an approximately hour-long interview as part of the CMS Colloquium Series podcast that comes out of the Massachusetts Institute Of Technology’s Comparative Media Studies program. They were there in connection with Cinematic Titanic Live‘s premier of Rattlers!, being performed the next day at the Wilbur theater in Boston. At about 31 minutes into the interview, the two MST3K alums were asked about movie riffing as being an American-only phenomenon and Trace let out the there was a Russian version on YouTube. This set Chris ‘Sampo’ Cornell to digging and on 27 January 2011, he posted his findings as a news item on the Satellite News website: the opening theme song. It was called Project Popcorn. Project Popcorn ( Проект “Попкорн” ) was produced by Anton Neumark and Timofey Chernov, in St. Petersburg, Russia, in 2002. They are life-long friends, and two of what turns out to be relatively few Mystery Science Theater 3000 fans in Russia. At the time, Anton Neumark had already become a rather successful musician and house music DJ in Russia and Europe. These days, he continues to tour all over the world performing shows and making people cut a rug, in that unique and squiggly way that aficionados of the club-scene do when hit with strobe-lights, lasers, and pulse-pounding beats. If you were in St. Petersburg roundabout 2001, you may have heard some radio commercials for cellphone company North-West GSM (now MegaFon). 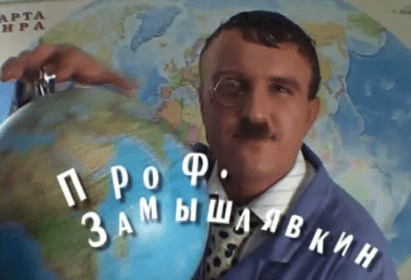 The music in those commercials was done by Чугунный Скорохол (Chuuguny Skorohod/Cast Iron Fastwalker), an electronic music group founded by Anton and friend Pavlig Koch in 1995. They produced a “compact disc” of music as a promotional item for NWGSM, until the company dropped CIFastwalker as its official band after it expanded Russia-wide and rebranded as MegaFon. When he’s not making or performing music, he’s running Ataraxy Records; a record label and booking agency. 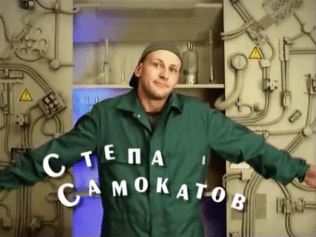 Anton played Styopa Samakatov (Стёпа Самокатов) in Project Popcorn, while Timofey played Professor Zamyshlyavkin (Профессора Замышлявкин) and Ketchup (Кетчуп). Timofey Chernov is, as best can be described, a businessman. At the time of PP, he was engaged in, as best as be can described, anything and everything. 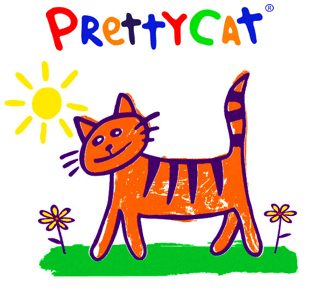 Not too long after circumstances forced the abandonment of the Project Popcorn project, he founded Pretty Cat. It’s a company based out of St. Petersburg that sells pet supplies. Its first product was kitty litter. One of Tim’s anythings and everythings was a biofuels factory that never got off the ground because of funding problems. He decided to turn this accident of fate into a kitty litter business which still operates to this day; keeping Tim in kibble, and allowing him to dabble in other anythings and everythings like real estate and tea distribution. Project Popcorn started out, as do many creative endeavors, through no fault of its creators. Tim, Anton, and some friends would get together, as do many people the world over; for camaraderie, to hang-out, shoot the breeze, and drink beverages of their choice. In one, or perhaps several (who can really say?) of these quite informal get-togethers (call it a party), the idea of making their own version of Mystery Science Theater 3000 was thrown out. Among fans of the show, this was not an unheard of suggestion; in this type of setting, or otherwise. Though what’s different about these particular MSTies (besides them being Russians) was that they actually did something about it. They put their euros where their eatin’ hole was and (after a fashion) got down to business. One of the friends, a real estate investor, had an apartment which was in the process of renovation for resale. Couches and fridges and other sundry and required items needed for hanging out were brought in, an apropos sign was hung on the door, and the apartment became a “club”: Club Popcorn. For about a year, Tim, Anton, and their friends would get together at the club, on a decidedly informal and irregular basis, to brainstorm and produce their MST3000 homage. Not only was there an informal schedule, meetings themselves were quite informal as well– they weren’t writers’ meetings in any literal sense. Over Vodka, Whiskey, Pu-ehr tea, whatever, the ideas would flow, and in its own time, Project Popcorn would take shape: a premise was invented, some movies were chosen and watched and watched and watched, and jokes were written. Sets and props were built, puppets were fabricated, characters were inhabited, and scenes were shot. After two episodes were in the can, the club fell victim to the flow of time. Club “meetings” had always been scheduled when it was the most convenient for “members” to participate, and were far from being a regular, everyday thing. Over time, it became more and more difficult for the club to convene. But, the nail in the coffin came when the wealthy friend who owned the apartment, sold it. After finding a new meeting place had been considered and determined to be financially impracticable, Project Popcorn was reluctantly cancelled. One aspect of Project Popcorn that did not take place at the club was post-production. Editing of all the betacam footage into something resembling a television show took place in the basement of Sergey Babulino, who worked for a local TV station as an editor. (He had a whole “editing studio” down there!) 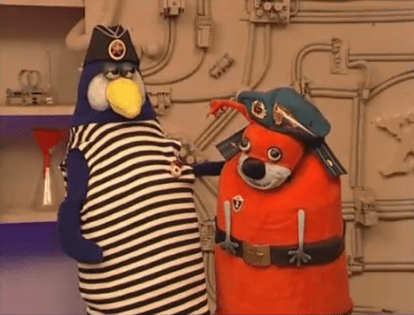 Though Project Popcorn was edited on equipment owned by a professional television editor, the fanvid was definitely not intended to be shown on Russian television. Nor, did it ever appear on television, Russian or otherwise. It was a for-friends, by-friends phenomenon. And, would remain so until Project Popcorn exploded onto the Internet seven years later. In 2009, after years of being “in the dust”, the friends got together to give PP a better home. They took Woody down from the attic, as it were. It was decided that parts of the original cut of PP may not be suitable for, or understood by, the uninitiated. So, both episodes were edited down, some funky doughnut shaped transitions were inserted, some new end credits were created, and in March of that year, Project Popcorn took ru-tube by storm. Googlevideo and YouTube also got a piece of the action. Action, which owes its beginnings to the days of perestroika. As younger men (circa 1989-1990), in whatever Russians call high school, Anton and Timofey participated in a foreign exchange program called People to People. As ambassadors representing Russia, a country not unfamiliar with hardship, they went to the United States of America as normal human beings trying to spread the spirit of goodwill, brotherhood, and peace. They would return to Russia as newly indoctrinated fans of Mystery Science Theater 3000. And, over the years, their American friends would keep circulating the tapes to them. They were hooked. They were MSTies! No longer would they suffer the hardship engendered by a deficiency in the movie riffing arts. Under the influence of these neoMSTie evengelists, the Soviet Union would fall. Project Popcorn is a fan-made video project in the style of Mystery Science Theater 3000. It was produced in St. Petersburg, Russia, over a year of time spanning 2001 and 2002. There were two episodes produced. Both are entirely in the Russian language. The premise is that Styopa Samakatov is a down-on-his-luck fellow who is hired by Professor Zamyshlyavkin of the Brain Institute. Styopa’s job is to watch bad movies so that the evil professor can learn how to zombie-fy the minds of the world’s population. He wants to rule the world, you see. Styopa signs a contract, and is zapped down into a basement laboratory to watch bad movies produced under the iron fist of the Soviet Union. The second episode features the movie Гобой (literally, Oboe, better-ally, The Oboist). It’s a black and white number produced in Georgia (the peach of the CCCP). It’s about an oboe player whose friend from music school is coming to visit. The friend is very successful, the oboist not so much. While contemplating his lousy life, the oboist’s mind is distracted and he ends up getting into some wacky predicaments (such as accidentally getting on the wrong bus and ending up at a funeral!). Oh, those Georgian film makers. They so crazy! Episodes of Project Popcorn unfold like episodes of MST3K, in that there are alternating host segements and theater segments. Each episode ends with a stinger. And, there’s even a theme song written and performed by Anton Neumark and Pavlig Koch (who also played Fidel). It’s practically a Cast Iron Fastwalker reunion up in this piece! Besides Prof. Z, and Scooter Libby (see below), there’s two “mutant saboteurs” named Fidel (Фидель) and Ketchup. Fidel and Ketchup march into the first host segment of Project Popcorn: The Oboist in a manner befitting what is a day of rememberance for their adventures as mutants who sabotaged things. Fidel is wearing a hat, and stripey shirt reminiscent of the Russian navy. He’s a mutant penguin. His comrade, Ketchup, is a mutant dog. Red in color. Arms dangling ala Tom Servo. His ensemble features a kicky turquoise berret and matching epaulettes, as well as a black belt with a copper buckle that is to die for. Both mutants are bedecked with a single medal pinned to their chests. These costumes are removed for the first theater segment and never seen again. Professor Zamyshlyavkin has a very distinctive look. You may not be able to place it at first, but you’ll get it. Remember Charlie Chaplin? Okay, now you’ve got it. Making the evil scientist look infamously recognizable is, of course, on purpose. Charlie had his Hynkel. Project Popcorn has it’s Zamyshlyavkin. Though, perhaps, in 1940, Chaplin’s The Great Dictator was some kind of cautinary tale. Project Popcorn just needed a goofy looking bad guy. It’s all in good fun. There’re other just for fun things thrown in, as well. The names Zamyshlyavkin and Samakatov are puns. Russian puns. (punsky!) The professor’s surname is a mixture of words in Russian that conceivably could work out to something like “mediator” and “conspirator”. Try it. Styopa’s lastname translates to “scooters” or “of the bicycles”. Your babelfish may vary. T&A explain’s Styopa’s name along the lines of “Robert D. Cycle”. Taken further, Styopa translates to “step”. So, is the main character of Project Popcorn really a push scooter? PUNSKY! If you take a look at the credits, you’ll find some other cyrillic tweeks. For instance, they missplelled computer (Компьютерный). They explain it as analogous to spelling it as “komputer” (Компютерный). Turns out that the guy that did all of the computer graphics is super smart, so they thought it was funny to bust his chops a little in the credits. He also plays guitar on the theme song (Arseny Chernov, Tim’s broham). Something else you’ll find is “Управляющий по внешним связям”. No babelfish has ever survived this phrase. It’s “foriegn relations manager”. One of the members of Club Popcorn didn’t have a credit, so that’s what they got. They had an all around good time making that show. No need to leave anyone out. The credits (which are exactly the same on both episodes) also give a copyright of 2009. But, weren’t they made in 2002? Yes, but these are the edited-for-content versions. Those came out in 2009. Don’t go bothering them for copies of the original episodes. You don’t speak Russian, so what’s your deal, anyway? Besides, the website they show at the very end doesn’t exist. The first episode of Project Popcorn features, as an experiment, an educational short about the history of space exploration. It’s called Дорога К Звездам (Doroga k Zvezdam / Road to the Stars). Though “history” is a strong word. The film (in color!) starts out explaining how the famous Russian scientist Циолковский (Tsiolkovskiy) figured out physics and invented the staged rocket design. Then, the history goes into the far future and shows Russian men and women inventing rocket systems and learning about zero-g ballet. You will thrill as the cat watches television on a pin-wheel-design space station. This semi-propagandical soviet short climaxes with Russians landing on the Moon. All thanks to Tsiolkovskiy, and good ol’ Russian knowhow. This movie was made in 1958. Years before anyone learned that nobody was going to ever make space stations, let alone walk on the Moon. Wait. What? Oh. Anyway, the final frontier wasn’t conquered in quite the way it was portrayed in Road to the Stars. Though, apparently the movie ended up on American television at some point and won a lot of filmmaking awards. Check out the final host segment if you want to witness a mutant talking dog wearing a space helmet, and a mutant penguin trying to fly.